New Delhi, 01 November, 2018: Society of Indian Automobile Manufacturers (SIAM), the apex national body representing the Indian automobile sector, in collaboration with Japan Automotive Recyclers Alliance (JARA), organised its 11th Asian Automotive Environmental Forum (AAEF) in New Delhi today. Organized in India for the first time, the 11th AAEF event is titled “Automotive Recycling in India: Pathway to the Future – Towards a Sustainable Society”. The focus of the conference was on setting-up viable infrastructure and providing solutions for handling End-of-Life Vehicles (ELV) in India. Over 150 delegates from China, Japan, USA, India and other countries participated in the AAEF conference. Representatives from the government departments and key stakeholders also took part in the symposium to share their experience in establishing vehicle recycling infrastructure, ELVs and the learnings for India. The participants urged for to proactively involve and help reduce dependence on single technology and focus on varied forms of automotive recycling used globally to take on growing need for recycling ELVs as vehicle penetration is growing in India. The speakers also urged the government to ensure that issues related to vehicle recycling in India are addressed and adequate policy roadmap to be put in place. Welcoming delegates Mr Yu Jeong Soo Ph.D, Professor, Tohoku University said responsible recycling and sustainable development is crucial for auto makers and there is an urgent need to create a viable infrastructure and provide solutions for dealing with end-of-life vehicles (ELVs) in India. Mr Sujeet Samaddar, Senior Consultant, NITI Aayog pointed out that the ground situation on recycling vehicles is not so good in India and needs immediate redressal. He stressed that the focus on automotive recycling industry needs to grow at the same speed as the Indian Automobile Industry. The kind of vehicles now recycled will be unique to India in terms of recycling capabilities, he added. Captain N S Mohan Ram, Advisor, TVS Motors & Chairman, SIAM Recycling Group stressed on evolving environmentally feasible, socially acceptable and economically viable regimen for recycling of ELVs which, he said is increasing exponentially. “We are the fastest growing economy in the world and have a huge consumer base and demand for mobility, both for personal and public use. However, due to lack of ELV recycling procedures and infrastructure, makes it a big mismatch, as we are one of the world biggest manufacturers of vehicles,” he observed. He also appreciated the role of SIAM’s recycling task force group, which participates in international conferences to collect data and supports actions to set up world-class recycling infrastructure in India. Ms Rashmi Urdhwareshe, Director, ARAI spoke about Indian Government’s vehicle scrappage policy, which is expected soon and will have fleet modernization schemes and aim at encouraging voluntary scraping of old vehicles. “The government initiatives and the upcoming policy on scrapping of vehicles will enhance the scope of ELV regulations, fleet modernization, vehicles nearing their end life, dismantling centres are located and controlled in structured manner,” she explained. Ms Neeti Sarkar, CEO & Project Director, NATRIP expressed her concern over scrapping of vehicles in India that is largely managed in unorganised sectors. This she pointed out, results in weak reporting of data of scrapped vehicles. In this regard, she recommended establishing of sufficient number of Recycling Centres across the country that would ensure robust network between agencies and organizations involved in collecting, dismantling and disposing ELV wastes. The conference also offered an opportunity for participants to interact with the global experts on automotive recycling and other related sectors. Besides the event also provided a window to showcase organization’s products and services to the automotive recycling sector. Commending the role of Indian automotive recycling industry, Mr Sanjay Mehta, President, Material Recycling Association of India (MRAI) stated that India doesn’t have specific recycling zones whereas other developed countries have special zones. He further informed that MRAI would spread awareness for recycling by organising public programmes at different levels. “Our vision is to make India a zero waste country by developing Circular Economy Parks. Metal Recycling Industry in India employs nearly 1.9 million people and has the potential to contribute around 5 per cent to country’s GDP,” he explained. 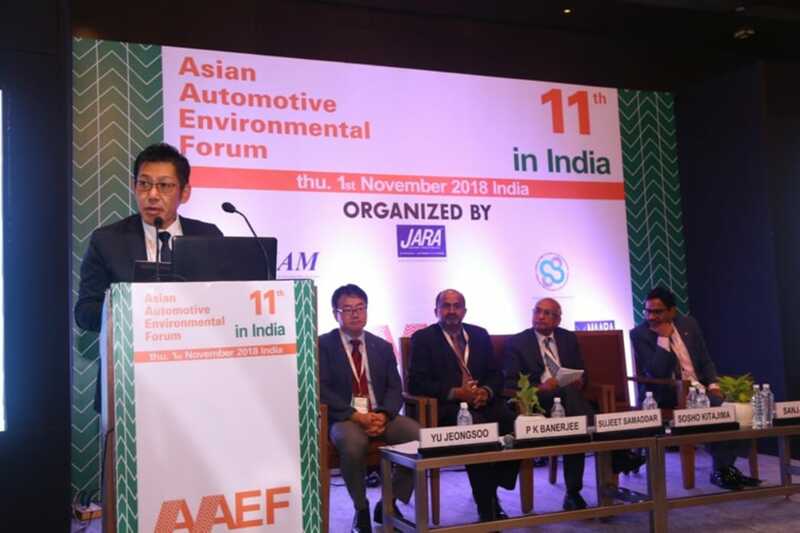 Thanking the AAEF for providing an opportunity, Mr Sosho Kitajima, MD, NPO JARA spoke on increasing number of vehicles in India the means to ensure and contribute to sustainable development in India and all automotive recyclers through the Forum. “The AAEF will become a big platform for relevant Industry bodies across Asia to exchange latest vehicle disposal techniques and build a sustainable future,” Mr Kitajima asserted. Mr David Nolan, Executive Director, Auto Recyclers Association of Australia, submitted the Australia’s industry report. He expressed concern that Australia faced problems of metal theft, illegal practices in recycling industry linked with criminal networks. “India must also regulate this sector by putting in place enforceable laws and enforcement resources,” he stated. Ms Sue Schauls, Executive Director, IOWA Auto Recyclers Association while submitting her report on United States saidself-audit can get one ahead of the rules to come. “Self-governing will help you participate in formation of recycling laws. All waste too have value to be reused or burnt,” she averred. Mr Cho Chee Seng, General Manager, ECO-R, Malaysia while submitting Malaysia’s industry report before the 11th AAEF stated that Malaysia too faces similar challenges like India for recycling ELVs. “Almost 85 per cent of the local used parts in automotive sector in Malaysia are unusable for reuse,” said Mr Seng. In his closing remarks, Mr P K Banerjee, Executive Director (Tech), SIAM said “the E of Evolution and Engineering is important, right from product engineering to process engineering while dismantling for End-of-Life Vehicles (ELV). India needs to evolve, as recycling is the central theme of sustainable life”.